Oops, that should be "fishermen." How could a fisherman be in houses? 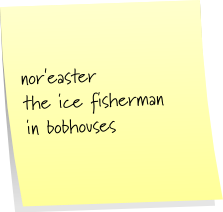 Although we're at oppositve ends of the spectrum in terms of the lengths of our writing, I always get a charge from these, and today learned a new word: bobhouse!